It was a year ago Wednesday that a massive oil spill began in the Gulf of Mexico with an explosion aboard the Deepwater Horizon oil rig. 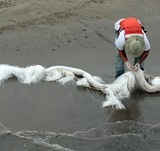 It took three months to seal the underwater oil gusher, and the region continues to work to recover. Click on the image below to access a timeline in which we look back on how the NewsHour covered the story from the beginning to present day. We built the timeline using ProPublica’s TimelineSetter, an open source media tool.